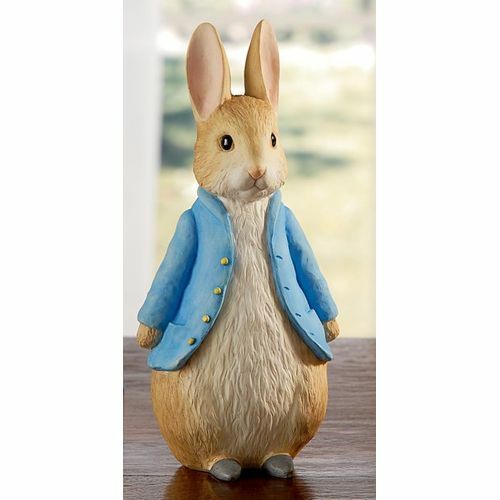 Beatrix Potter Peter Rabbit Large Figurine - A20957. From the Border Fine Arts World of Beatrix Potter Large Figurine Range. Height: 17.5cm. This vibrantly coloured figurine, which remains faithful to some of the original illustrations of Beatrix Potters work, is a wonderful addition to the World of Beatrix Potter Figurine Collection. Although it would be a treasured item for a patron Beatrix Potter collector, it would also make a delightful gift for a young child, to introduce them to a world of character and fiction that has entertained generations. Jemima Puddle-Duck is also available in the large figurine range.